If you haven’t heard the Sharks debut album No Gods yet, then you don’t know what you’ve been missing! Call it punk, call it rock’n’roll – either way, it’s utterly brilliant and classic! Some say they’re as good as The Clash and I think that says it all. 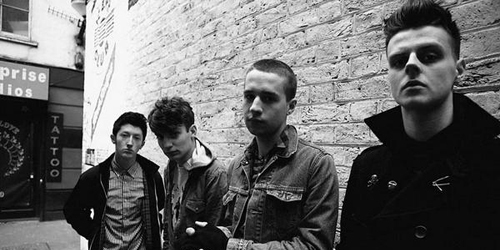 Four guys from Leamington Spa are taking the UK music scene by storm. And so they should. Thanks to bands like this, the hope for us rock’n’roll lovers is rising. Their previous work The Joys of Living: 2008-2010 which compiled tracks recorded during their first two years was a bit rougher record, but it assured you that whatever was coming next was going to be no other than extraordinary. No Gods gives you well mastered and catchy guitar riffs and drum beats that are such a pleasure for your musical soul. Put the record on and stop caring about the outside world. Just play it as loud as you can and trust me you’ll want to hear it all over again. The first track on the album ‘Til The Wonders Rise gives you such a buzz with it’s guitar intro that you’ll instantly have no doubt that you’re gonna enjoy the whole thing. And that is not the only track on the album with an epic opening. Just check Turn to You or Patient Spider and you’ll agree that Sharks know how to open in style. Arcane Effigies, which was also their first single (watch video bellow) makes you scream of excitement for its catchiness and for those who are not familiar with Sharks, it should be enough no convince them how good this band is. And it’s not just the music. The vocal blends perfectly with the sound and the lyrics actually have a great meaning which makes Sharks already one of the best new bands out there. They have it all. It’s really hard to pick a favourite song on the album, but other than the ones I mentioned above, the ‘must hear’ tracks also include Able Moving Hearts, Luck and No Gods. Just dig into it. This album is a journey. And a very happy one. Its a ‘must have’ in your music collection.